Andrew Porter Inerview with Bruce Duffie . . . . . In 1960, Porter became the editor of The Musical Times. 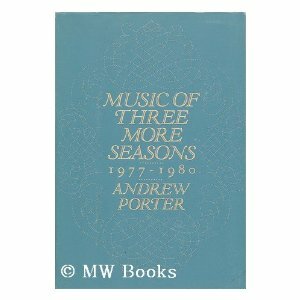 From 1972 to 1973 he served a term as the music critic of The New Yorker. He returned in 1974 and remained the magazine's music critic until he moved back to London in 1992. His writings for The New Yorker won respect from leading figures in the musical world. 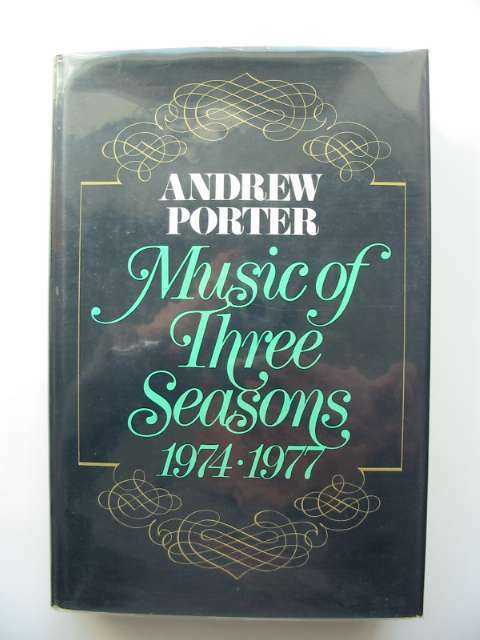 The composer and critic Virgil Thomson, in a 1974 commentary on the state of music criticism, stated, "Nobody reviewing in America has anything like Porter's command of [opera]. Nor has The New Yorker ever before had access through music to so distinguished a mind." 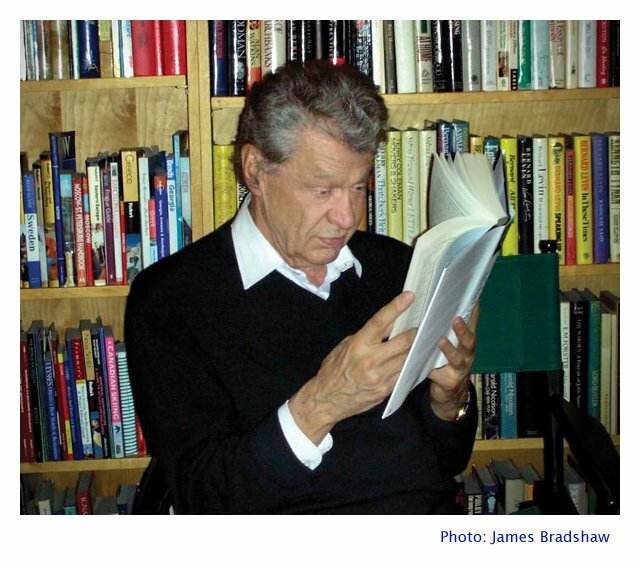 In more recent years he has written for The Observer and The Times Literary Supplement. He has translated 37 operas, of which his English translations of Der Ring des Nibelungen and The Magic Flute have been widely performed. He has also directed several operas for either fully staged or semi-staged performance. He authored the librettos for John Eaton's The Tempest and Bright Sheng's The Song of Majnun. 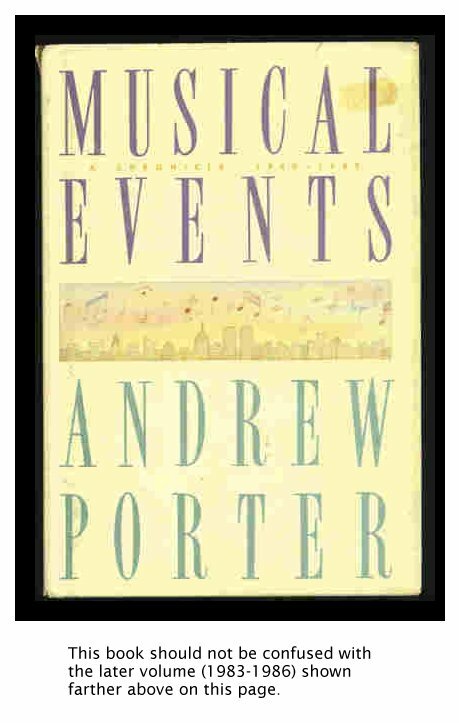 In 2003 Porter was honored with the publication of a festschrift, Words on Music: Essays in Honor of Andrew Porter on the Occasion of His 75th Birthday. Nicolai Ghiaurov, Arleen Augér, and Claudio Abbado. 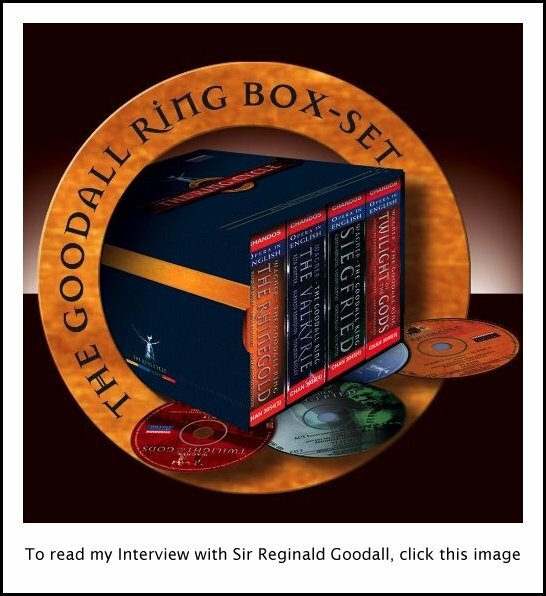 In the course of doing interviews with musicians and those who are connected with the Concert Music World, I have had the pleasure of turning the tables on a few writers and critics. Usually the ones asking the questions and providing prose for publications, it was their turn to respond to my inquiries and give answers to my follow-ups. Meeting with Andrew Porter allowed me to come face-to-face with the most respected sage of the day. His vast knowledge and practical experience gave weight to his words — both in print and spoken to me. Naturally, I asked about things regarding the work of the critic, and tried to pin him down on several points — ideas that most of us seem to wonder about quite often, especially when there is disagreement. Sometimes he would refine my questions and other times he would be direct and responsive. But in every case, he showed immense skill and genuine class about our topics. He knew what he would and would not share, and how he would parry ideas until they were succinct enough for his response. We met in March of 1988 on one of my rare visits to New York City, during the period when he was writing for the New Yorker magazine. No matter where you were in the US or elsewhere in the world, reading Porter’s column was a joyful obligation. Those thoughts and opinions remain of such importance that many of his columns have since been reprinted in book form. One wonders now, in 2012, whether these kinds of anthologies will continue to be produced because of the availability of the material on any publication's website archive, but I will leave quandary that for another generation to argue. When I arrived at his apartment, it felt very comfortable since there were tons of recordings, stacks of books (both on and off shelves), and an organized disarray of papers and other items from a life being lived just as mine was! There was furniture someplace under all the material, but he just plopped down on the floor, so I gladly joined him there for our conversation. This is a man who has thought about music from both historical and practical angles all his life, and he conveyed this accumulated wisdom to me as we spoke . . . . .
Bruce Duffie: Let us start off with an easy question. What is the real, ultimate function of the music critic? Andrew Porter: It’s a big general question, so you don’t get an answer. You could say, “What is the function of this music critic writing here, or that one writing there?” There’s no big, simple answer to that. The function of a critic on a daily paper is different from that of a critic on a weekly paper or a monthly paper, or a critic who writes books. BD: Should it be different? AP: Yes, I think it should. One’s working in a different format. I would say the function of a critic on the major newspaper of a big town is largely that of a chronicler. One of the things he has to be, among being a good critic and everything else, is a chronicler. He and his colleagues chronicle what’s happening in the music life of the town, whereas on a monthly paper or weekly paper, obviously that aspect is less important. BD: Is one better than the other or just different? AP: No, it’s just different. It’s like any of those things; one is doing basically the same kind of thing but in a very different circumstance. BD: You’ve worked as both? AP: Yes, I started working on daily papers, and was, in that sense, a chronicler, getting to review things. Sometimes it didn’t interest me enormously, such as debut recitals, though sometimes they did something different. But it was a kind of job just to make it clear to the readers what was happening in the town. AP: Yes, very much. I much prefer now, where I can choose something to write about, something that interests me, and then I hope I can possibly be more interesting about it. BD: Is it really fair for you — or any critic — to decide beforehand what will interest you? AP: No, but it would be even more unfair to decide that you’re going to go to something which doesn’t interest you at all, and go with the presumption of boredom! [Both laugh] That won’t necessarily happen, but obviously will in certain cases. There may be composers whom one finds boring, which are being done, and one knows from long experience that one will have no interested response of any kind to it. BD: Is it really fair for any critic, though, to have any kind of pre-judgment whatsoever before walking in? AP: What do you mean by pre-judgment? If they are composers I don’t admire, that in a sense is a pre-judgment. Pre-judgment is judgment, isn’t it? [Both laugh] I’m not talking about performance now; I’m talking about program. BD: There’s no chance that there’ll be a wonderful revelation? AP: There’s always that chance, yes. Sometimes it happens, and it’s wonderful when I think, “Gosh, I’ve been wrong about that all my life.” It’s usually some performer that does it for one. BD: Do you then go back and re-evaluate everything, or do you start fresh and go on? AP: I’m trying to think of a composer whose work I don’t admire but people go on playing. Yes — Boito’s Mephistophele, a very popular opera. They go on playing this all the time, and what happens to me now every time I go is I think less well of it, and I don’t think anyone is ever going to manage to persuade me that it’s anything but the most inferior sort of opera — from a musical point of view. BD: Then do you dodge reviews of that if you can? AP: Because other people go on telling me what a good opera it is, I have plugged away and I’ve gone to see it once every five years or so. I think now I’m going to give up. I really have tried! BD: So if someone asks you to review it, you will dodge it if you can? AP: Yes, unless it includes some performer I very much want to hear. BD: And you’d be able to separate the work from the performance? AP: You never generalize on these things. BD: I understand. But you’d be able to separate the performance from the work. BD: How fair can a critic be? How fair can you be? AP: What do you mean by fair? AP: Yes, but fair in what sense? Obviously I’m faulty and fallible and all that; everyone is. AP: Conclusive, not. One tries to be all those other things — balanced, rational, observant; passionate, I think, which is a good thing. I guess I err, sometimes, on the side of over-enthusiasm, but that, on the other hand, is a quality I value, particularly not just in myself, but in audiences generally. It is this feeling of passionate commitment, possibly slight exaggeration, tipping all the way. I don’t know. People tend to be like that in music if they care about it very much, slightly over-valuing or slightly under-valuing in different ways. I don’t think there’s any harm. You might say I’m being unbalanced, unfair in that way when I go overboard about something that’s really excited me, whereas a cooler head might have said, “He’s going too far.” But music is a thing that does make one go too far. BD: And that’s right? Music should do that? AP: I don’t know whether it’s right or wrong, it just does to anyone who cares about it! I’m thinking of opera now, something very complicated. There is a kind of watershed principle, almost, that if a thing tips over on the bad side, then everything about it seems bad; whereas if it’s something that’s simply wonderful, then you are able to take in your stride. It could be bad scenery or various bad aspects of it. I’m thinking of Maria Callas, in a way. She was so great that her failings don’t seem all that important in any kind of evaluation, although it will, obviously, to a bad critic who has remained unaware of them and thought everything she did was wonderful. It wasn’t that. She was wonderful, and therefore the faults didn’t seem to matter so much. That’s true of composers, too. BD: But those imperfections might block people from trying to get to know her. AP: It might well, because different people in music value different attributes, and somebody who thought the most important thing about singing was absolutely beautifully, steady, true, even tone might, in that sense, slightly be blocked with Callas’s greatness. I suppose what a critic does is to be appreciative of all these different things, and admire Tebaldi for what she could offer and Callas for what she offered. BD: Do you go and enjoy what you can? BD: If you know you’re not reviewing a concert, do you go and enjoy it differently? AP: I know it’s discretion sometimes, but I don’t think so because I’m now in the position of not knowing, when I go to a concert, whether I’m going to review it or not. I go to three or four times as much as ever I write about, so in a sense, I’m really not using any kind of different approach, but just deciding after the concert whether I have something to say or not that seems to be worth saying. BD: But if you don’t have something to say, is that not judging it badly? AP: No, not necessarily. It might be, but it’s not very interesting to read about bad performances unless one’s... well perhaps it can be, but it’s not much fun to write about them. It is fun to write about good performances. I suppose most things in the world exist in some kind of gray area, which is neither terribly good nor terribly bad, and those are often rather boring to read about, too. AP: Well, aren’t they? There’s always a journalistic danger of exaggeration. It’s linked to what I was saying about what music does to one. But there is this danger of trying to turn gray either into black or into white, to make it more readable, more enticing, more journalistic. BD: How much are you journalist and how much are you musician? AP: I hope there isn’t any huge dichotomy between those two things. I’m something of each; I don’t think of separating things into columns. When I was writing on a daily newspaper, I was what might be called anti-journalistic. I did not want to produce striking, catchy first lines and things, and fought this all the time! BD: Do you feel this way now? AP: No, even less now. The ideal review for me seems to say that Miss Something performed such and such a work in such and such a place last night. AP: A nice, flat statement of fact and take it from there! BD: What do you say to people who hang on your reviews for their ideas of whether things are good or bad? AP: I don’t think they do that much now that I write in a weekly paper, often writing weeks after the event, anyway. They can’t wait that long to make up their minds. I don’t think they do, anyway. This image of people wondering whether a performance was any good or not, and whether a new symphony is any good or not because the Times the next day tells them so — I don’t think it’s so. People do make up their own minds about these things. BD: Should the public care about what you think of a performance? AP: No. What they should care about is the performance itself, if it’s an important one. What I’m putting forward is not so much what I think about it as trying to give an account of it. BD: You say, “If it’s an important one.” Should every performance we go to be an important one? AP: It would make life very tiring if it were, but possibly it would also make life very exciting. I suppose people who don’t go as a profession do go, as far as they can, to important performances. BD: Is there no place in one’s life for a less important performance? AP: I don’t think there’s much now, when performance level is so high. I see no point in going to a run-of-the-mill Mahler performance, when first-rate Mahler performances are available. I’m taking an example of something that comes out that way. BD: But, for instance, there are going to be a lot of community orchestras which will try to play Mahler. Should they not have audiences, knowing that this is going to be either a run of the mill, or perhaps even mediocre performance? AP: But in the community where that community orchestra is playing, this will be an important event. BD: Oh, I see; the importance changes. AP: Well, it certainly does, yes. I don’t want to say it’s good enough for Hartford, Connecticut, but not good enough for New York. That is the danger, obviously, of this line of arguing. But, its importance does change as to availability. BD: Is this one of the things that you decide beforehand, whether or not performance is important? AP: No, it isn’t. Some things are obviously important. A new work by Elliott Carter is important, so that’s a straightforward thing; or a pianist I’ve not heard of. I don’t know whether it’s using this word “important” or not, but if something in the program attracts me, or if somebody I trust has said, “This is somebody worth hearing,” obviously I will go along. I’ve no idea in advance whether he’s going to be important or not. BD: Is there any danger that perhaps young performers coming along are going to try to put something into their program, whether they can do it or not, just to catch the eye of a reporter? AP: [Laughs] Obviously a performer giving a recital in New York for the first time is going to try and make a program that will attract the critics. Let me leave me out of it a minute. It’s less important in the daily papers, who attend debut recitals much more than I do, and they obviously will include something of that kind on their programs, and rightly, I think. But they won’t put in something they don’t like or they can’t play, because that wouldn’t serve the purpose at all. BD: They have that much foresight? AP: Well, yes. No one is going to put something on the bill he thinks he plays badly, just to attract people. BD: But might they not might try to do something special, and then perhaps it doesn’t come off well? BD: But he obviously didn’t set his recital on a certain day, knowing that nothing else was going on. AP: You can’t do that in New York. Would that it were possible, but it seems there is so much going on that you simply don’t know what’s going to happen. BD: Is there too much going on? AP: No, I don’t think so; there isn’t for me. There’s too much of what we were calling the “non-important” concert going on, such as rather routine performances by the Philharmonic. No, I’m not even going to say that. The Philharmonic is bound to play all these concerts each week, so they can’t make every single one of them important. I think it does try to. The fact that they can’t achieve it is, I suppose you’d say, the result of being too much. But on the other hand, it does mean we do have an orchestra in permanent employment. The same goes for the Met, which does put on some less than brilliant performances in the course of its churning out seven operas a week. But that, again, is inevitable in that system. BD: The Met is trying to sell four thousand seats for every one of those performances, so people are going to go, hopefully. AP: Yes, people will go, but they will go and hear big names and they will go and hear popular operas. Then the Met will do something as good as Khovanshchina and it will be playing to not very full houses, although it’s one of their very best performances this season. That’s rather a big subject to strain towards. BD: I want to ask a big question, and I hope you’ll answer it. What is the purpose of music in society? AP: It’s not essentially different, I think, from the purpose of any art. I’m giving you a rather sort of cliché answer, but it is to interpret experience, to enable one to evaluate one’s own life in the terms of great artists. It would help one to understand one’s own life, as well as theirs, and life in general. A blurry answer to a big question, but you might also say what is the purpose of poetry, or painting, or drama, or any of these things, and similar answers would come. BD: Is there a balance between artistic achievement and entertainment value in music? AP: All the best comedies that I know fit in with my definition. They’re entertaining, but they at the same time do teach one something about human nature and enlarge one’s experience of the way people behave and think. If you think of Don Pasquale, you could hardly have a more entertaining opera, but at the same time it is an opera that goes very deep into human experience. I can’t think of what we might call just pure entertainment. When opera — because we’re keeping on this theme — becomes purely commercial, then I don’t think it has much artistic value, and if it has artistic value, then it’s probably something more than mere entertainment! BD: Whose fault is it for dragging it into the purely commercial side? AP: Greed, I suppose; wish for money, wanting to make money more than wanting to make art. BD: Do we lay that blame at the feet of the agent, or of the management, or of the singers, or of the public, or the critics? AP: It isn’t a blame you could put on anyone. It’s a very widespread thing. Partly you could put the blame on the fact that theaters and concert halls get bigger all the time. They are harder to fill, more expensive to maintain, and therefore artistic ambition tends to be compromised by commercial considerations. A visiting conductor will want to play some rare modern symphony, and they’ll say, “No, play Beethoven 5.” It depends. There are so many different factors; it’s not a simple answer at all. AP: I think it’s going into smaller and smaller houses, and smaller companies. It’s going to find its future not in the three-thousand-seaters around here, but in the thousand-seaters — and a little bit bigger and a little bit smaller — where there will be people doing exciting music drama, while the big houses, such as the Met, will play big spectaculars as they are doing now. BD: Are the big houses going to remain, or are they going to atrophy and die? AP: It’s very hard question. It’s hard to be general about this. I’d been feeling rather gloomy about the whole state of opera as an art form, thinking that what I’d been seeing here in New York was not really a serious form of art on the whole most of the time. I then go to Chicago and I see a performance of Lulu, and I see a performance of Figaro which both seemed to me of the highest artistic endeavor, and absolutely wonderful performances! So I said, “This is nonsense! Chicago is a very big house indeed.” So it’s not the fault of the house, it’s artistic intention, because there were two performances which were on every kind of dramatic and musical level, serious and well done, but also — at least Figaro was — as entertaining as those works should be. I began to think there is a place in the world for big house opera, because if this is what it can offer us, it’s offering us something worthwhile. BD: Lulu was not entertaining at all? AP: I thought that the director had missed the jokes most of the time. It was very striking, but it wasn’t as funny as I believe Wedekind and Berg intended the piece to be, with the funny bits. BD: But it was still a strong presentation? AP: It was a terrific presentation, yes. BD: I am, of course, very chauvinistic about Chicago, but why can’t New York, with all of its resources and everything behind it, come up to that level? BD: Right. She makes sure the limb is supported all the way around. BD: But then, is it good that she keeps building these limbs farther out? BD: Someone coming to opera for the first time, though, is going to be taken out on the limb. Should they not start in the trunk of the tree and work gradually out, the way the company does? AP: No, no, no. One keeps meeting people whose first opera was Wozzeck. I think anyone who went to that Lulu would understand that this is gripping musical drama. I don’t think you have to start with La Bohème or Magic Flute. BD: You can just drop right into the mainstream and be taken along with it? AP: If it’s a good enough work and it’s well enough done, yes. BD: What advice do you have for other music critics, either young or old? AP: Never do what your editor tells you if you think it wrong. That would be my first thing. Always fight for what you believe. Some compromises have to be made, but not many. Don’t go to things because he wants you to go to them if you think you should be going to something else. Don’t allow anybody to cut your copy. If it needs cutting, and practically every piece does, insist that you are the one who cuts it yourself; you keep control of it that way. Don’t allow any changes. When I first came to this country, I was horrified to find that there were editors who simply changed things that their critics had written, which seemed to me absurd. BD: Not just cut, but changed around? BD: Are you pleased with the writing that you’ve done over the years? When you look back at some of the things you wrote twenty or thirty years ago, are you still pleased with them? AP: I suppose everybody feels this way, but gosh, in those days I had more life and vivacity in my writing than I do now. I had sharper responses. I don’t look back very much, only occasionally because I have been to see something or hear something which I knew I’d written about twenty, thirty years ago. I look to see what I thought about it then. One has that depressing feeling that one’s getting old and dull, but there it is! BD: Not that one’s getting old and wise? AP: Sometimes one does seem a little wiser. I’m a little more polite than I was, and that’s probably a good thing. I don’t think there’s any point in rudeness in criticism. I don’t mean to be less severe, but just slightly more polite in the way I put things now than I did then. I’m slightly shocked also when I get back to the early, brash things I wrote twenty or thirty years ago! BD: I hope you didn’t say anything that you really regret. AP: No. I wrote a lot of nonsense, but I suppose I do that now. If I’m spared longer, I’ll find that again! I undervalued things that turned out to be good and overvalued things that have long since been forgotten. But I think that happens. BD: Is that not your taste changing? AP: Yes, it is. It’s over reaction in the first excitement of meeting something that produces, perhaps especially in those overnight notices, an over-violent favorable or unfavorable reaction which does get modified by time. BD: Doesn’t the public’s taste modify over years, too? AP: Yes. The repertory changes. The Grieg Piano Concerto and the Schumann Piano Concerto are not now played once a week as they used to be, or the César Franck Symphony, which were the staples of repertory when I began being a critic. Mahler was very rare when I began. I had to cross the channel in order to hear Mahler’s Sixth Symphony because it was never played in England. Now I can practically hear it five or six times a season in New York, and probably in most other towns of any size. So yes, the taste does change. The repertory changes. Operas come and go, symphonies come and go in that way, and Mozart and Beethoven hold steady. Handel comes back. There is a constant changing, but I’m thinking that’s not so much a change of valuation, which is what I was thinking about earlier, it’s just a change in appetite on the public’s part. BD: Is that what makes a piece of music great, that it survives the changes in appetite? AP: If it’s a great piece of music, it can survive centuries of neglect and then come back again. BD: Tell me a little bit about doing translations. You’ve translated out of French, Italian and German, so what are the major differences among those three languages when coming back into English? AP: I always try to translate in a way that sings. I try. It’s not something one can achieve, but it is an aim to translate in such a way that the words sing along the music almost as if they’d been written that way, which means a matching of sounds, or hard and soft accents. Achieving that from the German is much easier than from French or Italian because the languages just have more phonics in common; hard consonants, brighter sounds. In translating from the Italian, it’s hard to get something smooth that will lie without intrusive consonants across a long lyric phrase. BD: But you’ve managed it in some cases? AP: Sometimes one’s lucky. Sometimes something comes to mind and it works. There’s not an opera I’ve translated I wouldn’t rather hear in the original language, but that probably is a function of being a translator. AP: Yes I am, but I’m saying for myself, once I know the work awfully well, I think, “Gosh, how I’ve spoiled these beautiful sounds!” But if I didn’t know what the sounds meant, of course I would settle for translation, always. I think supertitles are helpful. They’re better than not understanding. BD: Having your druthers, would you rather hear it in English, or see it in English? BD: Basically, though, for a concert life you’re looking for a smorgasbord? AP: Yes. Music is like that. I like to hear string quartets in small halls and huge symphonies in big halls, and medium sized symphonies in medium size halls with medium sized orchestras. BD: You mentioned recordings. Do you feel that opera works well on recordings, being such a theatrical experience? AP: Yes, it does. I can’t quite tell you why, but obviously it does because I’ve enjoyed such an enormous amount of them. Look at the records on my shelves. I do think it works very well, but it works in a different way from opera in the opera house, and one needs both. On records, you can assemble, probably, better casts than most of the companies can assemble. You can rehearse them more carefully. BD: And then you can assemble the performance? AP: Yes, you can do that, and if it’s skillfully done, then it can be a kind of better-than-real-life thing. BD: Should a recording be better than real life? AP: Why not? I don’t see why not. Take a simple example. If somebody gives a wonderful performance of the Liebestod, but goes out of tune on the last note, it would be absurd to put it out that way. But then you’ve also got the recordings of live performances, so nothing’s exclusive in this game. There are many different kinds of things to enjoy. BD: And you enjoy a lot of them? BD: What about television? Do you think opera works well on a small box? AP: Yes. Again, it’s a very different experience, and again it depends on the opera. I thought Lulu, for example, is an opera that worked wonderfully on the box with close-ups into the singers’ faces, supertitles, all taken in one with the image, not having to look up and down. Aïda does not work so well, but once it offered something different. I was watching a performance of it not too long ago, and there was a close-up onto the soprano. I was thinking then, with this huge set all ’round her, that suddenly one realized the extraordinary way that everything was turning on one small larynx, and how it worked in this huge drama. It gave you a strong feeling. It may have been un-dramatic and have nothing to do with Aïda herself, but it gave me more of a sympathetic identification with the singer actually singing the role than I’ve ever heard in the theater, where you tend to be taking in so much at the same time. BD: But of course that’s the fault of the television director, good or bad. AP: It wasn’t a fault; it was a glory, I thought. I felt I’d really learned something about it! BD: What advice do you have for young performers coming along? AP: I don’t think anything really helpful at all. If a young performer came and said, “I’m thinking of playing this program in Merkin Hall next week or next month or six months hence. What do you think of it?” I could probably produce specific advice on that particular thing. But big, general advice, no. BD: Are there no wrong roads that most of the singers are following? Or most of the pianists or most conductors? AP: I don’t know about pianists. There are so many different roads all the way which lead to a career that I couldn’t say. I should think one possible wrong road singers are following is just trying to make too much volume too soon, wearing out young voices. One’s resources grow all the time, but it’s a fairly general observation — and lots of people are making it, and I think it’s absolutely true — that a promising young singer will be taken up by a management that would push her too far, too fast, and make her do roles which are not comfortable or lie too far outside her current resources that she actually does vocal harm to herself by taking these parts. Singers began much younger in the old days. They made debuts at the age of twenty or twenty-one in places like the Vienna State Opera, whereas now you find people in their thirties who are still at college. So it isn’t just a question of tackling roles too young, but I think it is a question of forcing out too much sound too early into too big a space. I have known singers who haven’t lasted long as a result. AP: I belong to the old school of not liking big, flashy conductors who over-gesture. I belong to the Sir Adrian Bolt school of a stick in the hand, and the fingers move and the wrist moves, and perhaps in an enormous climax the elbow might move! But the shoulders probably don’t move at all, and certainly the knees never move! But that’s just a visual taste of mine. In effect, of course, what matters is the sound that comes across. If Lenny Bernstein jumps into the air to make a great big climax — but he gets that great big climax — then of course he’s using the right technique for him. So no, I haven’t any rules for conductors in that way! BD: Well, not necessarily rules, but advice? AP: Only very obvious ones. Don’t make unnecessary gestures. Work with economy so that when you do make a big gesture it does tell, and you haven’t been going around like windmill all the time. BD: How about advice for management? BD: Yes, I’ve turned the tables on you. BD: This is what I am driving at. What are some of the things that make good managers? AP: Good managers have a feeling of what their artists can achieve and what they’re capable of achieving, and what will push them a little bit further in the right directions but won’t overwork them. It’s all obvious, what I’m saying. BD: It’s obvious to you, but it’s not so obvious to some others. AP: It’s obvious to anyone! Bad managers are people who push their artists too fast, too hard, and overwork them and strain them. BD: What about managements of organizations? AP: Every single one is different. The management of an orchestra depends on the town and on how many orchestras it’s got. AP: Yes. I don’t think it’s going to die. I’m not optimistic about music in exactly the way it’s happening today, but it’s impossible to tell what’s going to happen. We talked about the change in repertory taste; anything might happen. We might go back to smaller orchestras and smaller halls, not necessarily smaller audiences because if you divide three thousand into two and halve the orchestra, you’re going to get very good Beethoven and Berlioz performances going at the same time! [Both laugh] I’m optimistic about the future of music because I think there are many good composers today, and I also think that this urge of human beings to express their deepest and profoundest thoughts in non-verbal language is something that, obviously, will go on. Music is something built right deep within the human personality, and people are going to go on making it. BD: Are you optimistic about the future of music criticism? AP: I think it will continue. I don’t know whether I’m being optimistic, but that’s enough of an answer. There’ll always be people who want to share their experience verbally with other people. It’s their experience of music, and if they do it well then obviously music critics will continue to write. There seems to be less and less serious music criticism in the daily press. I’m thinking actually of England now, where for the first time since 1920, I think, the Sunday Times appeared without a word of music criticism in it. AP: This was because it had a new editor who was interested in stories and exciting things, and wasn’t interested in just reading about classical music. There was such an outcry that there was a reissue, but that kind of thing does happen. Less space is given to music in the New York Times and the London Times than it used to be in the 1930s, when there were several daily papers. There were also several good serious critics writing, so you didn’t get just one view, the view of the Times the next morning, you got quite long accounts in several papers of anything that seemed important. So yes, there is a shrinking. BD: Are the great performers today on the same level as the great performers of yesterday and the day before? AP: How can I tell? How far away is yesterday? AP: All right. In my experience there are more good string quartets playing widely today than there were in the 1940s. BD: But is the best of today as good as the best of yesterday? AP: That one is very hard to tell. It’s clouded by nostalgia, in a way. If I want to hear a Beethoven quartet on record, I will not bring out one of the modern recordings. I will pull out the Busch Quartet playing a Beethoven quartet. So in a sense I would say perhaps nothing has come up to the level of the Busch Quartet in Beethoven. Perhaps they were the best, but that’s just sort of the moment. In the playing of Beethoven piano sonatas, my standards are set by Arthur Schnabel and I don’t think there is a Beethoven pianist as great as Schnabel today. But there are great Beethoven pianists that can do things that Schnabel didn’t do, and give you different impressions. I wonder if to some extent one does look to the past for the greatest. Furtwängler is the greatest conductor I’ve ever known, and fortunately I did hear quite a lot of his work in my student years and early years as a critic. BD: Are there composers coming along who are going to sustain the level of Beethoven or Mozart? AP: You have to ask again in a hundred year’s time, but it would seem to me that there are. It’s not a question we can answer seriously. BD: You’re following Elliott Carter. Do you think he is in that league? AP: Yes, I do. That’s a name I would certainly bring up. Stravinsky, who overlapped with me for a good time, is obviously a very great composer. BD: I keep coming back to the idea that there are the very great composers, and then there’s the second level. Should we not make room for this second level of composers and performers? AP: Yes, because life is like that. If everything was on the heights, there wouldn’t be any heights. How much time should we give to the second level I don’t know. They have to be there in order for the first level to be there, and obviously we should give time. Perhaps it’s when you get to the third or fourth levels that one shouldn’t fuss too much. Boulez had a theory called the “water level” — that there were certain works, certain compositions, which rose above the water level. Most of them were below the water level. Some of them were just one fathom below, but some were one hundred fathoms below, so don’t bother with any of those. BD: Why bother to go below that water level at all? AP: It’s quite a persuasive theory. Charles Rosen has it, to some extent, in his book The Classical Style. He didn’t bother with all these minor composers, because it’s the higher ones that really mean something, and define life for us. Of course, who is to say who is to set the water level? What I think of George Lloyd, say, is not what a lot of other people think of George Lloyd. BD: What do you think of George Lloyd? He is coming to Chicago this fall for a performance with the Chicago Symphony. AP: I think he’s extraordinarily over-rated; he never realized the potential of his very early pieces. I heard him conduct a new symphony in Albany not long ago. He is still busy, but I’m just baffled by the kind of acclaim he has! On the other hand, there were people who were baffled by the acclaim Mahler had in his day. They just couldn’t hear it in his music at all. So, we don’t set the water level. I will tell you a hundred years hence who are the great composers of our day. BD: Is being a music critic fun? AP: Yes, it is. It’s fun a lot of the time if what you care about is music passionately. Of course it’s fun! It’s wonderful being sent to hear all the things you want to go and hear, instead of having to cue up and buy tickets and try and get into sold out houses and all that. The un-fun part is wrestling with your prose, really working, working, and trying to get things in shape, and the despair of saying, “God, that’s not really quite what I think; how can I get across what I feel about this?” That is the hard work part of it. But the fun is listening; the fun is score reading; the fun is reading music history and making discoveries occasionally. AP: Yes, on the whole I am. I think it’s a slight danger in that it’s been very, very heavily edited. BD: [Protesting] I thought it was supposed to be not edited. I thought it was supposed to be just the original scores as Verdi wrote them. AP: No. It’s been quite heavily edited, absolutely scrupulously, with everything that’s been added shown as an addition so that you can penetrate below to see what Verdi wrote and what he didn’t write. But they are edited to the extent that anyone who is not prepared to go through this notation is likely to accept as gospel what you see in black and white there. This is the strange thing. Ricardo Muti performed Rigoletto here, and what he performed was Rigoletto by Verdi as edited by Martin Chusid, accepting every slur, every dynamic, instead of a slightly cleaner score, in which the conductor can make his own decisions about slurring, about dynamics, about articulations. BD: I’m confused. I thought that there weren’t supposed to be any Martin Chusids included in the new edition. 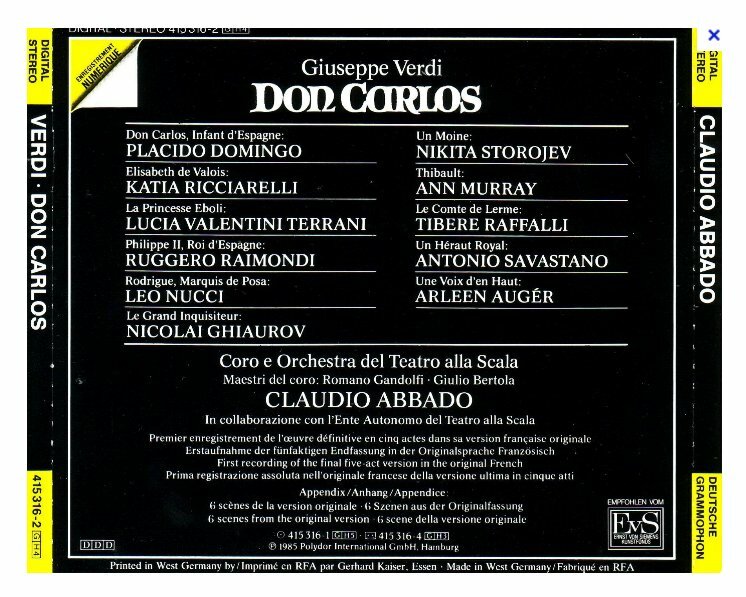 AP: Verdi left out a lot of the central markings in his autographs. Someone’s got to put them in. BD: Should that not be left to each individual conductor? AP: If they’re as sensitive of Verdi as Martin Chusid is, yes; and of course, in accordance with the cast in performances. I do think there’s a slight danger. 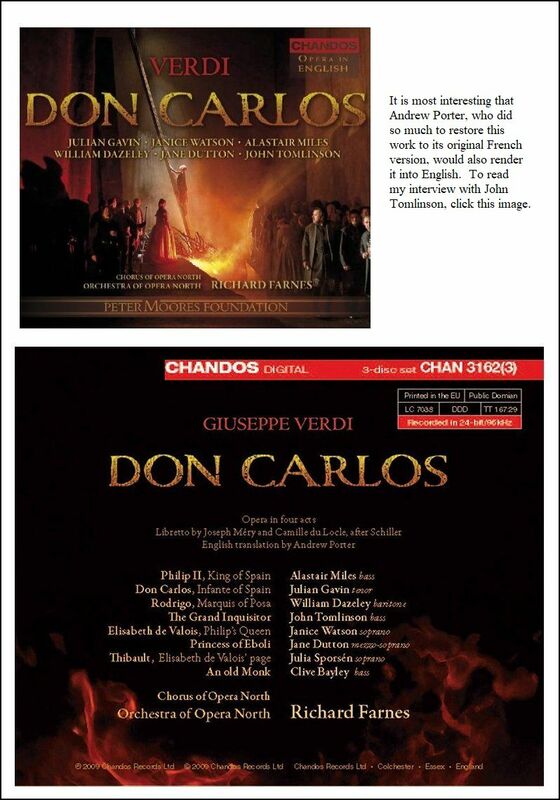 On the other hand, Ernani, the second one which has come out, is less heavily edited. So to that extent, Rigoletto was a pioneering one. It’s a wonderful thing to have done it, to be able to see what Verdi wrote. In the previous editions, the editors put things in, but actually everything was put in with the same emphasis. BD: What is your latest book? AP: My latest book that’s appeared recently is a collection of three years of New Yorker reviews. 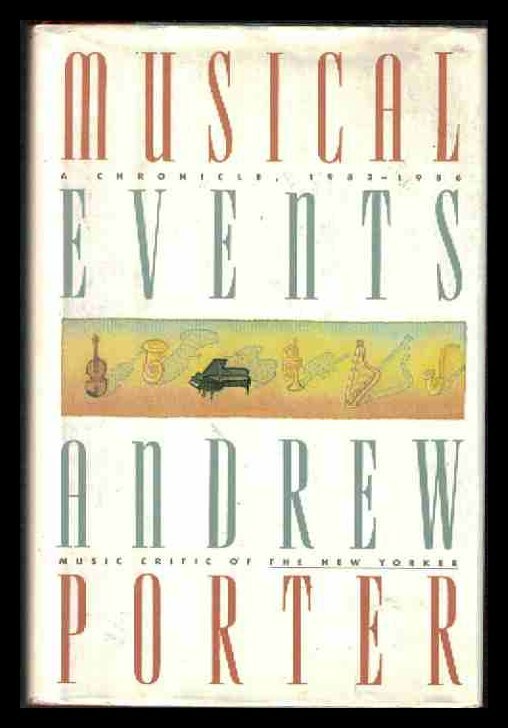 It’s called Musical Events, a Chronicle, 1980 to 1983. It’s a chronicle of what I’ve been hearing mainly in New York, but also quite a lot of travel. It’s published by Summit Books. BD: When you go back to look at these, do you re-edit your reviews very much? AP: No. I think that would be in a way wrong. I cut out anything that seems to me to be the gray areas, which are of no interest to read about now. I remove those and I correct any facts that have slipped past the formidable New Yorker checking department, who’ve checked most of those facts carefully already. One or two things occasionally slip by, so those are put right. And usually when I have second opinions, I show them; I add them as such, actually not revising the opinions first felt. The first time I heard Philip Glass’s opera, Satyagraha, I felt about it much more favorably than I did when I re-heard it. Therefore I added a short post-script, more or less saying that although this is a first-time reaction, the second-time reaction was much less positive. BD: That shouldn’t scare away people from going to it? AP: No, because I think it’s a good idea! BD: But you go back and hear it again and again and revise your impression, and yet an audience will have only first impressions. AP: Yes, that is so, and it’s a difficulty especially when it’s a difficult new piece, like Elliott Carter’s A Symphony of Three Orchestras, which does make a good impression the first time on most people, but does need listening to several times. I don’t know; what do I do? Before I write, it’s played four times by the Philharmonic in its series, so I go and hear it four times. Obviously I’m not writing as a first-time hearer, I’m writing as a fourth-time hearer who’s also got hold of the score, and by then possibly has also got a tape and may be a twentieth-time hearer. It’s all right; as I say there are different kinds of criticism. There’s the critic of the daily paper who only gets one chance, or, if he’s industrious, a couple of rehearsals and then the first performance. BD: And then possibly a real short deadline after that to write! AP: Yes, and that has its value. That will be a first impression of how it strikes someone, a musical person, the first time. Then you’ll get another impression from someone who’s had time to go into it a bit and possibly see how the pieces of it relate to one another. That will have its value — possibly more value in the long run, I suppose. The more you know about something, the more accurate you’re likely to be when you describe it. BD: I assume if you’re running up against a deadline, you just simply hold it over and put it into the next column, rather than forcing it into the column that is needed at that very moment? BD: Are you ever trimmed for space at all? AP: Yes, a little bit now — a little bit more than we used to be. There’s new management at the New Yorker now, and I suppose you’ve noticed I’m not writing every week as I used to. BD: I was very disappointed in that. AP: That is a decision of the new editor. BD: Did you scream about that? AP: Oh, no. What am I to do? [Both laugh] I still think it’s the best job I’ve ever had in the world, and I still have more space than I’d have anywhere else. So I think that screaming would be unreasonable. I was just slightly disappointed, let’s say. On the other hand, I have more time for listening now. BD: If you have an absolutely free evening, what do you listen to? Or do you listen to anything? AP: It’s hard to say if it’s absolutely free. Scattered around me are tapes that have come in of works that I’ve put to one side, saying, “I want to listen to these when I have a free moment.” They’re records which I’ve heard once or twice, but want to hear again, so that is how the free evening, if it’s going to be spent on music, is likely to be spent. On the other hand, there are plenty of books I want to read! BD: So, there’s never enough time? AP: Oh, no. Is there ever for anything in life? BD: Thank you for sharing some of it with me. I appreciate it very much. This interview was recorded in Andrew Porter's apartment in New York City on March 24, 1988. Portions (along with recordings) were used on WNIB later that year, also in 1993 and again in 1998. This transcription was made and posted on this website in 2012.